Recreational vehicles, such as boats, are often used during the summer months in Redlands. Seasonal storage, however, may need to be considered when the boats aren't in use regularly, as they are during the vacation season. Seasonal storage needs to be considered by individuals who are not using their recreational vehicles regularly. Leaving your investment outside in the elements can cause both interior and exterior damage to the boat. 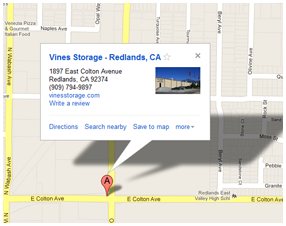 Many Redlands residents that consider off-site storage of their recreational vehicles go to Vines Storage. Vines Storage offers a variety of options when it comes to storing recreational vehicles and other personal property. With both indoor and outdoor storage, there are a number of options available for those who want to keep their property elsewhere. When considering seasonal storage for boats, owners can choose indoor or outdoor storage. When storing a boat outside, many boat owners will measure and purchase a tarp. The tarp is used to cover the boat when it is outdoors to protect the interior and exterior from weather damage. Paint can fade, and interior upholstery can mildew and mold, so having a proper tarp to cover the boat is essential to keeping water and sun damage from occurring. Another consideration is indoor storage. Vines Storage facility offers indoor and outdoor storage, to meet your needs and desires. Indoor storage will allow boat owners to take care of their boats in the best way possible, and protect them from the outside elements. Tarps can still be used to cover the boat to protect the inside from dust and debris, but it is not as necessary as it is for outdoor storage. Vines Storage offers a variety of storage options for Redlands residents, as well as a number of amenities for recreational vehicle owners. From a wash bay to dump stations, Vines Storage can help you make the most of your storage investment and enjoy amenities that most facilitates cannot offer their customers. Call today to learn about optional boat and recreational vehicle storage and about how our facility can help you protect your investment!